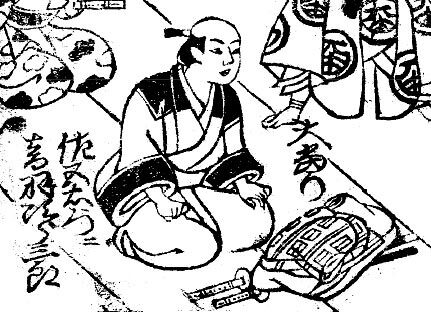 End of the 1670s ~ 1690: he performs in Kyôto as a wakashugata; his first stage name is Otowa Minenosuke. 1691: he becomes tachiyaku in Kyôto and takes the name of Otowa Jirosaburô I. Spring 1700: Jirosaburô produces in Ôsaka Ki-no-Kaion's play "Keisei Mugen no Kane", which stars Kataoka Nizaemon I. 1st lunar month of 1701: Jirosaburô goes back to Kyôto and plays at Ebisuya Kichirôbê's theater the role of Sadanojô in the new year drama "Miyako no Waka Ebisu", which is produced by Yamashita Hanzaemon I. His others stage partners are Ogino Samanojô I, Kanazawa Goheiji, Yamashita Sagoemon, Okada Samanosuke and Yamamoto Kamon. 3rd lunar month of 1702: Jirosaburô's rank in the Kyôto hyôbanki, tachiyaku section, is jô-jô (superior - superior). 1st lunar month of 1704: Jirosaburô goes to Ôsaka and plays the role of Okazaki Akushirô in the new year drama "Koi no Minamoto Yumi Hajime", which is produced by Iwai Hanshirô II. Jirosaburô's rank in the Ôsaka hyôbanki, tachiyaku section, is jô-jô (superior - superior). He shares the same rank with Osagawa Jûemon, Sakurayama Shôzaemon I, Yamashita Matashirô I, Murayama Heijûrô I and Takioka Hikoemon. Fall 1707: Jirosaburô goes to Edo. 11th lunar month of 1707: Jirosaburô plays at the Ichimuraza in the kaomise drama "Hachinoki Ôkagami"; his stage partners are Takeshima Kôzaemon I, Hayakawa Hatsuse, Ichikawa Danshirô I and Kanazawa Goheiji. 2nd lunar month of 1708: Jirosaburô's rank in the Edo hyôbanki, tachiyaku section, is jô-jô-(shiro)kichi (superior - superior - (white) excellent). He shares the same rank with Ikushima Shingorô and Murayama Heiemon III. 11th lunar month of 1708: Jirosaburô plays at the Yamamuraza the role of Takiguchi in the kaomise drama "Yorimasa Shiki Samba"; his stage partners are Ikushima Shingorô, Ichikawa Danjûrô II, Nakamura Gentarô and Yamanaka Heikurô I. Fall 1709: Jirosaburô goes back to Ôsaka. 11th lunar month of 1709: Jirosaburô plays in Ôsaka in the kaomise drama "Maiôgi Masaki no Kazura", which is produced by Ogino Yaegiri I. He achieves a great success in a nuregoto scene in duo with Ogino Yaegiri I. 11th lunar month of 1710: Jirosaburô plays the role of Okinojô in the kaomise drama "Sasaki Uji Ôshimadai", which is produced by Sakakiyama Shirotarô I for the nadai Matsumoto Nazaemon. Jirosaburô's stage partners are Sakakiyama Koshirô I, Miyazaki Denkichi, Bandô Matajûrô I and Sodeshima Genji. 3rd lunar month of 1711: Jirosaburô's rank in the Ôsaka hyôbanki, tachiyaku section, is jô-jô-(hanshiro)kichi (superior - superior - almost excellent). 11th lunar month of 1711: Jirosaburô plays the role of Sasano Gonjûrô, in reality the young master Tokuwaka, in the kaomise drama "Daimyô Hitachi Obi", which is produced by Arashi San'emon III for the nadai Ôsaka Kuzaemon. 3rd lunar month of 1712: Jirosaburô's rank in the Ôsaka hyôbanki, tachiyaku section, is jô-jô-kichi (superior - superior - excellent). He shares the same rank with Miyazaki Denkichi and Shinozuka Jirozaemon I. 11th lunar month of 1712: Jirosaburô plays the role of the rônin Miyoshi Sangoemon in the kaomise drama "Inari Daimyô Shintaku no Kamado", which is produced in Ôsaka by Mitsuyama Shichisaburô. Fall 1713: Jirosaburô goes back to Kyôto. 2nd lunar month of 1714: Jirosaburô plays the role of Isuke in the kaomise drama "Tarôzuki Wakô no Ônuki", which is produced in Kyôto by Nakamura Shingorô I. The playwright for this kaomise program is Jirosaburô. His rank in the Kyôto hyôbanki, tachiyaku section, is only one little black stroke above jô-jô-(shiro)kichi (superior - superior - (white) excellent). Fall 1715: Jirosaburô goes to Ôsaka. 11th lunar month of 1715: Jirosaburô plays the role of Sayama Asaemon in the kaomise drama "Seiwa Genji Kaichû Fude", which is produced in Ôsaka by Arashi Sanjûrô I. 1st lunar month of 1716: Jirosaburô's rank in the Ôsaka hyôbanki, tachiyaku section, is back to jô-jô-kichi (superior - superior - excellent). He shares the same rank with Sawamura Chôjûrô I, Miyazaki Denkichi and Takeshima Kôzaemon II. Fall 1716: Jirosaburô goes back to Kyôto. 1st lunar month of 1717: Jirosaburô's rank in the Kyôto hyôbanki, tachiyaku section, is back to jô-jô-kichi (superior - superior - excellent). He shares the same rank with Shinozuka Jirozaemon I, Shibazaki Rinzaemon I, Osagawa Jûemon and Yamatoyama Jinzaemon I. 11th lunar month of 1717: Jirosaburô plays in Kyôto the role of Kamadoyama Taminojô in Sadoshima Saburôzaemon's kaomise drama "Iwao no Matsu Manbai no Midori", which is produced by Miyako Mandayû in his theater. 11th lunar month of 1718: Jirosaburô plays at Miyako Mandayû's theater the role of Sakuma Gorojirô in Sadoshima Saburôzaemon's kaomise drama "Meoto Matsu Jufuku no Kodane". His stage partners are Mihogi Gizaemon I, Bandô Hikosaburô I, Kaneko Kichizaemon, Hyakuninshu Genzaburô, Miyazaki Giheita, Yamamoto Kamon, Tamagawa Genzaburô and Yamashita Kamenojô I. 12th lunar month of 1722: Jirosaburô becomes zamoto and produces at Daikokuya Takenojô's theater a kaomise program (unknown title), which stars Yoshizawa Ayame I, Matsumoto Shigemaki, Nakamura Sôjûrô, Miyazaki Giheita, Kanazawa Hikogorô II, Yamatogawa Gorojirô, Iwai Izaemon, Fujioka Daikichi, Kirinami Senju II, Ichikawa Toyama III, Ichikawa Takegorô, Mizuki Masano and Bandô Matasaburô I. 1st lunar month of 1723: Jirosaburô produces in the same theater the new year drama "Keisei Hitomaruzuka", in which he plays the role of Sagara Wasuke. Fall 1723: Jirosaburô goes to Ôsaka. 11th lunar month of 1723: Jirosaburô plays at the Ônishi no Shibai the role of Moriguchi Sagoemon in the kaomise drama "Fukujukai Kogane no Minato", which is produced by Sakakiyama Shirotarô I. 1st lunar month of 1724: Jirosaburô's rank in the Ôsaka hyôbanki, tachiyaku section, is back to jô-jô-kichi (superior - superior - excellent). He shares the same rank with Arashi San'emon III, Kirinoya Gonjûrô I, Sakakiyama Koshirô I and Ôtani Hiroji I. Spring 1724 ~ Winter 1728: Jirosaburô does not perform in Kyôto or Ôsaka major theaters. 2nd lunar month of 1728: Jirosaburô appears for the last time on the stage of a major licensed theater, playing the role of Kurihara Sanzaemon in the drama "Man'yô no Hana Nishiki no Akebono", which is produced by Kanazawa Hikogorô in Kyôto. Nobody knows what happens to Jirosaburô afterwards up to his death in Summer 1732. Otowa Jirosaburô I was an popular Kyôto tachiyaku actor, who achieved fame for himself in Kamigata from the beginning of the 1710s to the middle of the 1720s. This short-sized actor was outstanding in jitsugoto roles. He was also a skilled playwright and became famous by adapting to Kabuki Chikamatsu Monzaemon's puppets drama, although he always refused to keep Gidayû chanting in his dramas.